It takes a lot to dedicate 3 years of Fridays during the semester and three 3-weeks in June. It forgoes many different opportunities and possibilities. It limits what can be done during the week and the weekends. It becomes a serious part of your life (and it should). But if you are working full time and in a relationship with someone and in a doctoral program, it represents a lot of challenges for everyone involved and that inevitably creates stress. The process is also intense at times which means there will be a range of emotions that you experience throughout (as evident in this blog series). The following are a list of recommendations and pieces of advice that I give with full admission that they may not be useful to you and that I was not and do not claim to be perfect. Some of these, I realized and got ahead of; others, I owe entirely to my partner's insight, thoughtfulness, and compassion. I generally don't like to give advice unless asked but also think this is a post that many might find useful as they take the steps towards their dissertation. In applying for a doctoral program and getting accepted, you should have conversations with your partner. These conversations should reassure a commitment to the relationship and a recognition of the time-demand of such a program. You should spend some time thinking about what kind of support is going to be helpful to you. Does having your partner hold you accountable to homework, deadlines, and such useful? Do you need your partner a sounding board for ideas or a helpful additional editor for your work? Do you need your partner to just take you away from the computer or book when it has been too much? Think about the strengths and abilities of your partner and how they can help you. That being said, do not assume they will help you or that they are there just to meet your needs. Hopefully, your partner does want you to succeed and if so, they may ask how they can help. They can decide if what you offer is what they can provide. Even if they can't provide that, you've at least created a list of things that you now realize you might need help with and can buildout support from other friends and family. You'll likely find that your life goes in patterns--each semester has its ebbs and flows. There are times things are light and times when they are crazy. There are also patterns to your days and weeks; times when you are awake and ready to engage in school work and times when you are not. Figure out these patterns and communicate them with your pattern as you discover them (and also, recognize that they can change). It helps yourself as much as your partner to give words to the patterns and figure out how best to be prepared for them. Share, share, share with them about where you are. We get lost in our work and we dive down rabbit holes of knowledge, theory, and so many different things. We get hung up on discussions from class and moved by realizations we encounter in the research. We get extremely stressed as deadlines loom or milestones approach. Share with your partner what's going on and how you are processing it. Are you stressed? Excited? Confused? Speak to those feelings and emotions and let your partner know. It doesn't always mean they will be receptive or interested--sometimes, we get overwhelmed in our avalanche of knowledge and ideas. But it's important to share where we are at and what's going on and allow our partners to decide what they do and don't want to engage with. Your partner is sacrificing a lot whether you realize it or not. Every hour you're in class or working on research, is time you're not available to them emotionally, mentally, physically or the rest of your family. They may be performing double-duty in a variety of ways. Make sure they know that you value and appreciate their support and sacrifices. Every time you realize your partner is picking up your slack, thank them. Write them notes, emails, cute texts, or anything else to let them know that their support matters. Some may need that while others appreciate it, but they certainly deserve regularly acknowledgment (and by the way, they better be in your acknowledgments for your dissertation--no-brainer). When our partners are stressed, worried, anxious, and drained, it has (or at least should) have an effect on us. So the fact that you are in a doctoral program where you are likely to be often in these states, means your partner is going to also be stressed, worried, anxious, and drained witnessing you. But that's on top of your partner's own pursuits, work, and demands. Be sure to acknowledge this. It's not enough to be thankful, it's important to speak to and support the effect you and their lives have on them. My partner and I identified a threshold of concern. If I got to a point when I was not working out regularly, then an intervention by her was needed. Working out (particularly running) is my self-care; if that falls off the radar then she knows that I'm in trouble and need help. Think a lot about what are your signs and your partner's signs of danger. Figure this out in advance of the program and set these as agreed markers to which veto power (however you define that) can be used. This can take some figuring out because you may not realize what your thresholds are. However, using these as the early warning system to things going downhill fast can prevent a lot of problems later on or irreparable harm. 5 or more years feels like a long time that stretches on beyond our comprehension. For many of us, if we look back 5 years, we're surprised at what has and hasn't happened. This is definitely a marathon experience but it is temporary. Reminding each other of this is important. It will cause stress but if you are pursuing it for the right reasons, it will also be a meaningful accomplishment that will come to an end. My partner was a genius in setting up a schedule so that ever 6-8 weeks throughout the first three years, we went away for a 3-day weekend to a bed-and-breakfast or some other place, where we could get away for a few days. We also instilled a standing date night once a week. These are but 2 ideas and obviously subject to resources. But the bigger point is to schedule together time. Not TV time, but time you spend together enjoying things you like to enjoy together. You should look to regularly reconnect with your partner as your studies inevitably consume much of your time and attention (that sounds like it's all-consuming but it's more like, you get interested in your studies and then you may also have work and other obligations--it all takes you away from the people in your life). Whatever milestones the program has, use as opportunities to celebrate. But while you're at it, throw in your own milestones and victories. Finished the first two classes--go out to dinner! Completed 1/3 of the course? Have a dance party in your living room! Passed the qualifying paper? Plan a trip to Europe! Celebrate with your partner the accomplishments and progress--make sure your partner knows you are not just excited but excited with your partner as you cross those milestones together. There are clear opportunities when you will have downtime. Yes, you will want that downtime to recharge and relax from the program, but equally important, is to make sure you spend a significant part of that down time with your partner, reconnecting or just enjoying one another's presence and time away from the program. Make it clear to your partner that you miss them or the things that you can't always do because of the program. So those are my general pieces of advice for making sure you give your all not just to the program but to the partner who will have to bear the burden of supporting you through it. 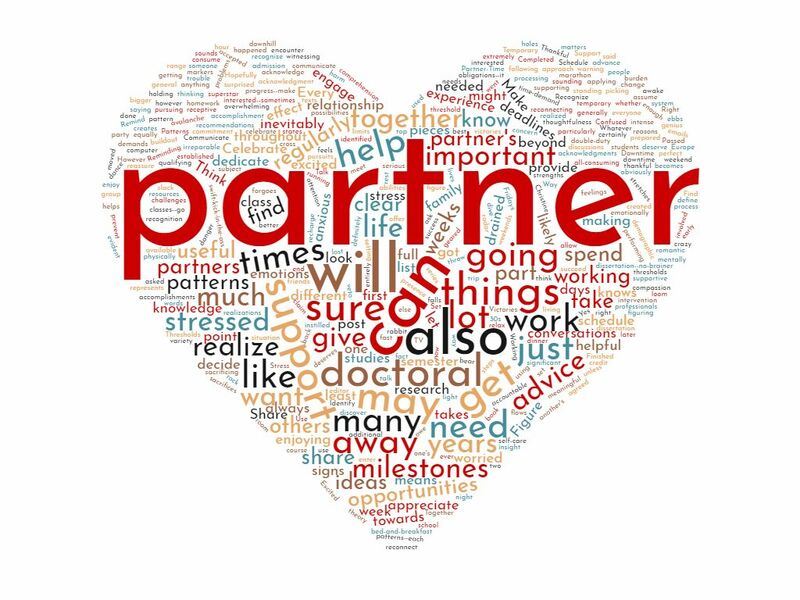 What advice do you have for doctoral students in making sure they are supportive of their partners?